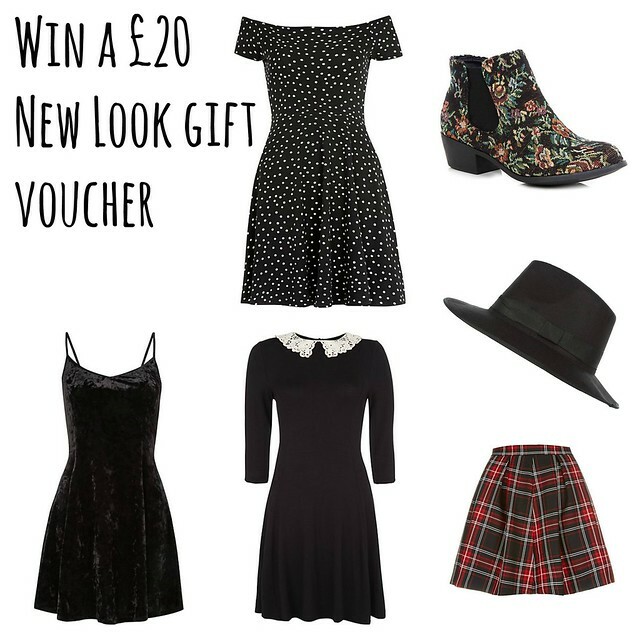 New Look has always been my first stop for shoes on a budget and a place where I update my wardrobe with the new trends at the best possible price so I'm very happy to offer one of you the chance to win a £20 New Look gift voucher. All the items below are available for £20 or under so you will be able to treat yourself to something nice if you win the voucher. To be in with a chance just fill in the rafflecopter form below and I will contact the winner when the giveaway ends an 12am on the 6th of November. Good Luck! I adore the off the shoulder dress! I would get this pair of shoe boots http://www.newlook.com/shop/shoe-gallery/wide-ankle-boots/wide-fit-suedette-button-shoe-boots_288722501 they are lovely and would go with lots. Ohh that black polka dot dress above has definitely caught my eye! But I could definitely do with some new knits to keep me a little warmer this winter. I would have to get the Tapestry boots I'm in love with them! There's a pair of very boring, sensible, black boots I've had my eye on for a while! I've been looking for the perfect black ankle boot for a while and they're the only ones coming close.The £20 would go towards them - I must be getting old! I adore the tapestry boots. Tapestry boots for me too! That polka dot dress is amazing; i am so in love with Bardot necklines at the moment! The polka dot dress is lovely! Need some new clothes, just had a baby and sick of still wearing maternity wear!! I need some waterproof shoes desperately! Definitely the tapestry boots! Gorgeous! the black polka dot dress is gorgeous, love it!!! I would spend it on either the polka dot dress or the boots - absolutely stunning! I'd have to get the black polka dot dress... there are so many ways to dress it up and down! You're right, those boots are amazing...and so is the hat! it's got to be the boots in the picture above! Loving the blog as ever, keep up the good work! They have a lovely black jumpsuit in the Tall range http://www.newlook.com/shop/womens/tall/tall-black-jumpsuit-_291883801 ... that would be my choice! I have been eye-ing up the accessories in new look for a while, so I would definitely get some necklaces to layer over jumpers for the winter! oh i love newlook and these floral boots are awesome!! I'm loving baseball shirts atm so I would spend it on one of them. A pair of New Look jeans as I love their jeans!! I love the tapestry boots too but I really need some plain black ones so I think I'd go for their Black Brogue Chelsea Boots first. I've got my eye on a sequin dress for Christmas celebrations! There are a pair of chunky ankle boots with metal trims that I want in black sooooo much!! I would love to get a nice pair of boots! I would get a new dress for my Christmas night out - love the polka dot one! I was actually admiring a similar black velvet dress from another high street store, but I live miles away from the nearest one, so the New Look version would do nicely! I'd spend it on the velvet dress in the image above. I adore it! I really like the little black velvet dress! I would love a new dress, possibly denim but I might change my mind! The tartan skirt is ace. i would get a lovely jumper!! like this one!! That crushed velvet dress - love! oh lord new look was the only "cool" shop were i lived so all my clothes were from there ! i love their boots the tapestry ones are so cute ! and the polka dot dress ! I've got soo many things for New Look recently, they seem to just be getting right this season. I looooove that off the shoulder heart dress! But I would choose this lace swing dress as I've spied it online a few times. I love new look! Its my favourite. That velvet dress is lovely. I would buy that. I'd get a cosy thick jumper or hoody! I desperately need a new Cardi! Something chunky and knit. Aaaah all my nice shoes are from New Look. I love that place! As much as I love that velvet dress I do need to stock up on knitwear for winter. id spend the voucher on some new jewellery ready for the party season! Anything with a peter pan collar! I love a bardot neckline, I want all the colours! The black dress with lace collar please! I'm tempted by the tapestry boots too! They are lush! I like that velvet dress, it looks lovely. I have seen a gorgeous forest green dress form New Look that I LOVE so that would be my choice! I need some jumpers ready for winter! I'd put it towards buying a warm coat for the winter. Tartan skirt and some jewellery! Love the Velvet dress...reminds me of Christmas! I love the Burgundy Buckle Suedette Ankle Boots - http://www.newlook.com/shop/shoe-gallery/boots/burgundy-buckle-suedette-ankle-boots_276755262. i'd put it toward some boots that I have already got my eye on. Would definitely be a help! My wife loves anything with polka dots so the polka dot dress in the picture! I cant say no to a good collar detail! Even if i would like rather Wednesday Addams-esque! The crochet collar dress looks so..proper! Love it! Would definitely buy that! My daughter would love the boots!